Describe the differences between the two main types of actions. Configure fields in an action layout. Set a predefined value for a field on an action layout. Add an action to the Salesforce app by editing the global publisher layout. Quick actions are the first stop on our tour of the mobile customization options. And we’re really putting our best foot forward here. Because with quick actions, we’ve given you the keys to the mobile kingdom. No kidding! It’s a bold statement, but it’s true. Of all the point-and-click customization tools at your disposal, quick actions have the most potential to transform the mobile experience and make you a hero to your users. So what are quick actions? Well, you can think of them as shortcuts. 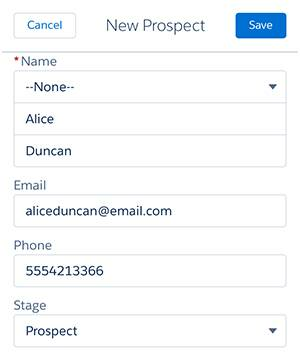 They offer a fast way for mobile users to launch a specific workflow in the Salesforce mobile app, like creating records, logging calls, or sharing files. The Salesforce app comes with some handy built-in actions, and they live in the action bar and action menu ( ) at the bottom of the screen. The action bar is visible on most pages, so quick actions are just one tap away for your mobile users. Pretty convenient, eh? But wait—there’s more! To call the quick action a mere shortcut doesn’t really do it justice. Here’s why quick actions are so special. You can create custom actions tailored to your own business processes and use cases. Each action has its own unique page layout, so you can limit the fields to just the ones mobile users truly need. You can prepopulate fields on the page layout to save mobile users some time. See? Quick actions are more than meets the eye. They’re actually three powerful features—a shortcut plus a page layout plus predefined fields—rolled into one small, mighty package. Now that you understand what actions are, we’re going to throw a curveball at you. There are two types of actions: global and object-specific. Object-specific actions let users create or update records in the context of a particular object. 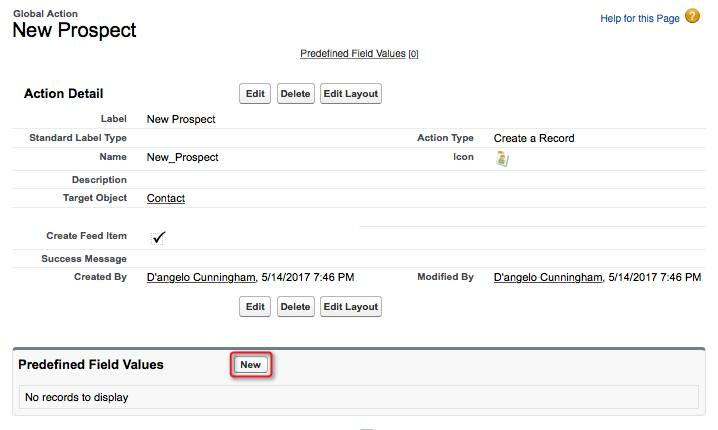 In the Salesforce app, object-specific actions show up on record detail pages. So for example, an action associated with the opportunity object is only available when a user is looking at an opportunity. Global actions let users create records, but the new record has no relationship with other records. And they’re called global actions because they can be put anywhere actions are supported—on record detail pages, but also places like the feed or Chatter groups. Clear as mud? Don’t worry, you’ll feel more comfortable with both kinds of actions after creating a few yourself. We tackle global actions first. Here’s a way to think about global actions: They’re things that users want to do quickly, but not necessarily completely. And that’s exactly how D’Angelo Cunningham will use global actions to make his brokers’ lives a little easier. Let’s look at DreamHouse Realty’s first mobile use case. DreamHouse Realty uses the contact object to keep track of their prospective home buyers. 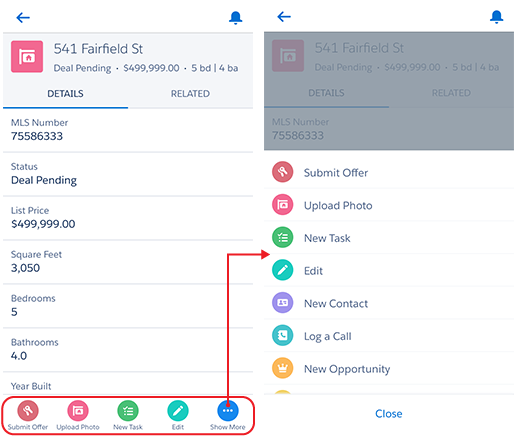 D’Angelo created a custom Stage field on the contact object that indicates the buyer’s current stage in the home purchasing process. A new potential buyer is in the Prospect stage. Now imagine one of the DreamHouse brokers is hosting an open house, and she meets a prospective buyer. She needs an efficient way to add the person as a contact without navigating to a specific page or associating the person with other information. That’s what a global action is for—quick things that users can follow up with later. To follow along with D’Angelo as he whips up a new global action, first we need to create the custom Stage field in our org, too. 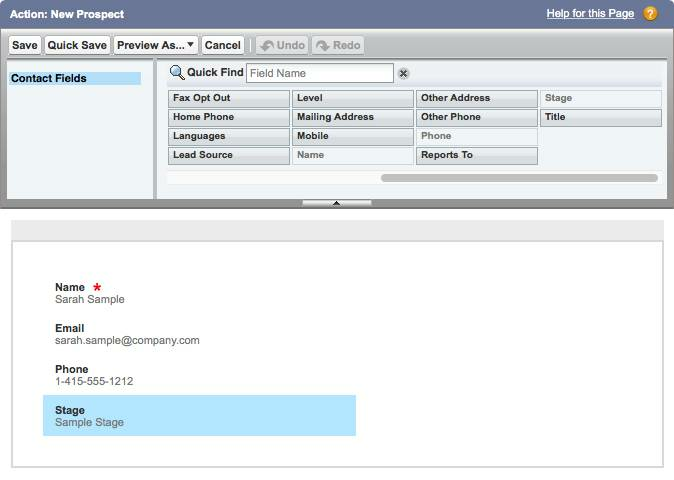 From the object management settings for contacts, go to Fields and Relationships and click New. Select Picklist as the data type, then click Next. For Field Label, enter Stage. 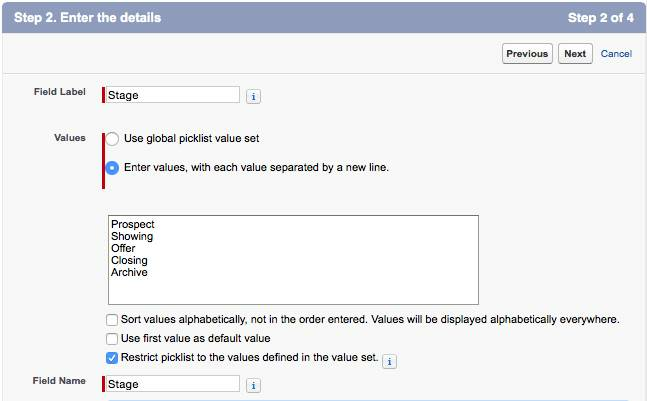 Select Enter values for the picklist, with each value separated by a new line. Select Visible so the field is available to all profiles, then click Next. Now that we’re on the same page as D’Angelo, we’re ready to get started. In this step, we add a global action that creates a new contact. We want this action to create a new contact, so make sure the action type is Create a Record. Actions can execute other processes, too—like logging calls or sending email. But be aware that global actions can’t update a record. Only object-specific actions can do that. In the Target Object dropdown list, select Contact. In the Label field, enter New Prospect. The most powerful thing about quick actions is that each action comes with its own unique layout that you can customize. That’s why it’s such a time-saving feature for mobile users; you can pare down to the essentials and remove as many unnecessary fields as possible. Let’s optimize the layout for the New Prospect action. D’Angelo wants to eliminate a few fields and make sure the custom Stage field gets added to the layout. If the layout editor isn’t already open, go to the Global Actions list, then click Layout next to the New Prospect action. Remove the Account Name and Title fields from the layout. Add the Stage field to the layout. When customizing action layouts for mobile users, less is more. A best practice is to include fewer than five fields, and definitely no more than eight. A great way to speed up the process of data entry for your mobile users is to prepopulate values for certain fields on an action layout. Go to the Global Actions list and click New Prospect. In the Predefined Field Values related list, click New. In the Field Name dropdown list, select Stage. In the Specify New Field Value section, select Prospect. Keep in mind that the predefined field values are tied to this specific action. 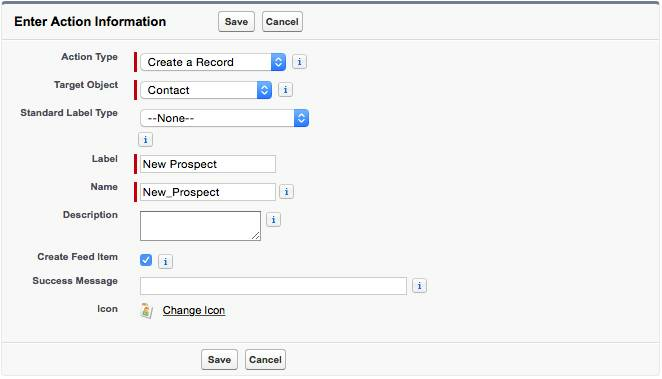 These rules only apply when a user initiates the New Prospect action in the Salesforce app, not when creating a contact from the full Salesforce site. OK! We have a spiffy new action with a mobile-friendly layout. But there’s one final step to complete. The action won’t be available in the Salesforce app until we add it to the global publisher layout. Global publisher layout… that’s a mouthful, isn’t it? Well, it’s just the technical way of referring to the way actions are listed in the action bar in the mobile app. The global layout only applies to the action bar in places like the feed or Chatter groups—basically, only on pages that aren’t related to a specific object. D’Angelo wants the brokers to be able to create a new prospect directly from the feed, so let’s add our new action to the global publisher layout. From Setup, enter Publisher in the Quick Find box, then select Publisher Layouts. In the Salesforce Mobile and Lightning Experience Actions section, if you see a link to override the predefined actions, click the link to override. Select Mobile & Lightning Actions in the upper palette of the layout editor, then drag the New Prospect quick action into the mobile section. Make sure it’s the first item. The order of the actions here determines their order in the mobile app. Reorganize them so the most frequently used actions are first, and remove any unused actions. Congratulations! You successfully created your first global action. Why don’t we launch the Salesforce app and take the action for a test drive? Select Chatter in the menu to navigate to the feed. Tap New Prospect in the action bar. High five! The new global action works as expected. Now that you’ve mastered the global action, let’s turn our attention to object-specific actions. In the next unit, you help D’Angelo improve the Salesforce app even more by implementing his second mobile use case.